Wow. What a year 2017 has been so far. And to wrap everything up with some nice shiny, colored paper, and top it off with a bow, I’ll be touring stores, complete with the newest Peanizles book, The Day The World Lost It’s Color. Also, I’ll have copies of all three Peanizles collections, It’s Pronounced Pea-Nih-Zles, Indoor Recess, and the latest collection, Drawn Of the Dead. And I’ll be complete with t-shirts and hats,. It’s one stop shopping for the whole family, and the comic fan in your life! 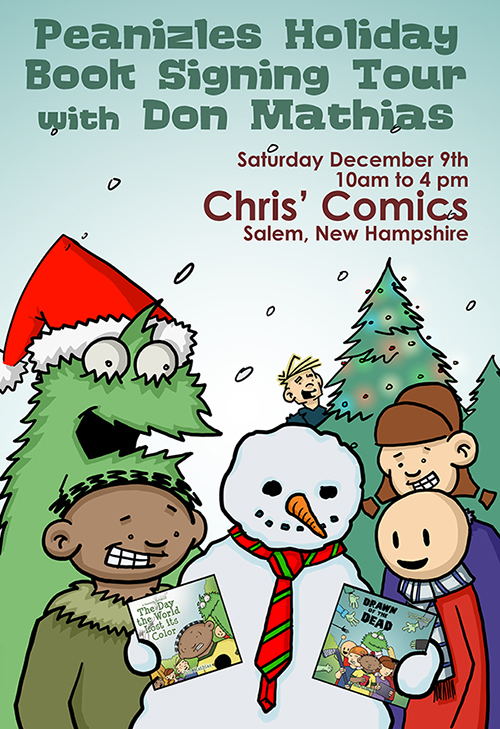 So Stop on by Chris’s Comics in Salem, New Hampshire, this Saturday, December 9th. When I’ll be there from 10-4. And get free high fives, and possibly some limited edition Peanizles movie posters. It’s another stop on the Peanizles Holiday Book Tour! This week, Don Mathis, writer, artist, and creator of the Peanizles comic will be at the very special comic shop Friendly Neighborhood Comics, in Bellingham, Massachusetts. He’ll have a bag full of all three Peanizles comic collections, It’s Pronounced Pea-Nih-Zles, Indoor Recess, the hilarious zombie epic, Drawn Of The Dead, and the acclaimed first Peanizles storybook, The Day the World Lost its Color (which is perfect for kids of all ages). As well as Peanizles t-shirts and hats. And if that wasn’t fun enough, he’ll be joined by Peter Simeti and Cody Sousa from Alterna Comics, Ben Goldsmith from Source Point Press, Cesar Feliciano from Comix Tribe, and our super powered, buddy Mike Doherty! Whew! So come, on, dress up in your very worst ugly sweater and come on and enjoy the festivities, cookies, do some holiday shopping for the comic fan in your life, or yourself. It’s time for one last book signing before Christmas! And this time we’ve saved some of the best for last. I’ll be at Harrison’s Comics in Woburn, Massachusetts, signing books, and drawing sketches for all the fans. There’ll be Peanizles books, shirts, hats available for kids and adults of all ages! There’ll be cookies, while supplies last! And Santa himself will be just feet awat taking last minute requests. I’ll be there with Chuck and the gang, from 10-4. So, make sure to make merry this Christmas and stop on by! I know Oliver’d love to see you.